The Centre for Contemporary Art, Lagos will present a third solo exhibition by Kelani Abass, titled ‘Àsìkò: Evoking Personal Narratives and Collective History’ from October 26 to December 21. In this body of new works, the artist explores the possibilities inherent in painting, photography and printing, strategies already suggested in his 2009 solo exhibition titled ‘Man and Machine’. In ‘Àsìkò’, he highlights personal stories against the background of social and political events built around three interrelated bodies of work, which also engages time and memory. The first and most symbolic is the ‘Family Portrait’ series. Instead of portraits of people, an object, the first typewriter purchased by his mother to start the family printing business, is used to signify the beginning of the story of the family’s trajectory. In the three paintings that constitute this series, the painted image of the printing press is positioned full frontal and centrally reinforcing the importance of the object and the way in which time is inextricably implicated through technological development and its symbolic entanglement with the family history. The second body of paintings, the ‘Calendar series,’ Kelani appropriates the template of the ‘Bomode Oku,’ an engaging way of telling stories and remembering events that have happened in a community. 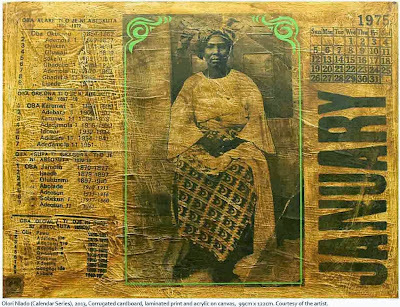 As a child, Kelani recalls clients coming to the family printing press with images of a loved one (usually deceased) and asking for a ‘Bomode Oku’ calendar that highlights the story of their town and community. 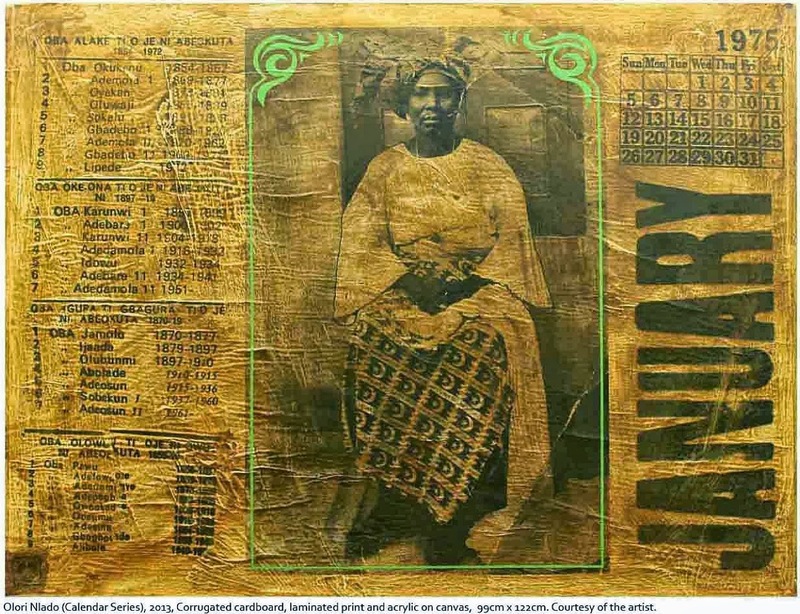 Kelani pays homage to this form of archiving and remembering and uses it for his own purposes in the ‘Calendar Series’ by superimposing within the painting, images of his late father, maternal grandfather and grandmother to create his own family ‘Bomode Oku’. In addition, he acknowledges the history of the family's origin in Abeokuta by creating calendars of two important Yoruba Kings, Oba Gbadebo I and Oba Ademola II whose reign in the late 19th and early 20th Century had an impact on the South -West Region of Nigeria. The last series, ‘Family Album,’ are large paintings embedded with photographs that place the nuclear family within the group at social gatherings and important events. By making a private narrative part of the social collective, he comments on the universal reality of his experience. In these paintings, the images of the past and present, analogue and digital, painting and photograph combine seamlessly, combining space, time, and medium. ‘Àsìkò, meaning time in Yoruba, is a nostalgic as well as a therapeutic tribute to a father, who despite the passage of time, his memories remain embedded in the fabric of the present. This is most visible with the inclusion of a book of ‘knowledge’, a material witness to the thoughts, ideas and encounters of the artist's father, late Alhaji Sumola Ajani Kelani. The arrival of Kelani Abass at this personal and professional juncture can better be understood through the local context and environment in which the works are created. ‘Àsìkò’ is a critical and artistic milestone that has accumulated over the past four years through a search for a personal visual language borne out of lived experiences. He looked for and took advantage of opportunities that involved exploring, experimenting, collaboration, research and critical thinking. As with many painters, Kelani uses photography as a preparatory tool for his work, but very few artists in Nigeria have placed it on the same level as painting, reinforcing hierarchical barriers between the ‘art’ of painting and mechanical procedure of photography. Could the breaking down of these barriers, which is evidenced in this body of work signal a new departure in the relationship between painting and photography in Nigeria? On this occasion, painting is presented with photography, printing and even the performance, not as a support, but as part of the expanded field of contemporary art practice. Kelani is dissolving the boundaries and constraints of his educational background and artistic environment; allowing him to weave a complex narrative of fact, fiction, mediums and materials that comment on the family, technology, time history and politics. Kelani Abass (1979) studied at the Yaba College of Art and Technology where he graduated with a distinction in painting. Since then he has had two solo exhibitions, ‘Paradigm Shift' (2009) and ‘Man and Machine’ (2011). He has taken part in several group exhibitions in Nigeria and South Africa. Kelani has won several awards and prizes including 1st prize in painting of the Caterina de Medici/3rd Black Heritage Prize (2010), the Yusuf Grillo Award for best painting student at Yabatech (2007). He has taken part in several residencies and workshops. He is a member of the Society of Nigerian Artists. ARAISM: Africa Portrayed As They Know It!